I acquired a special respect for Tofu a few years ago. Coming from what I call cow country (Uruguay), I never thought I could enjoy a dish if it didn’t have some kind of meat on it. Don’t get me wrong I still LOVE my meats but I have come to appreciate and really enjoy a lot of vegetarian meals too! So tonight for dinner I made some Honey Sesame Tofu baked sticks on a bed of Vegetable Quinoa. Slice the tofu into even sticks and mix the rest of the ingredients together in a small bowl. Dip the pieces of tofu in the sauce and lay them out on a non-stick baking sheet. Pour any leftover sauce on top of the tofu. Bake for 40 minutes until the outside is golden and the edges brown. Turn once halfway through baking. 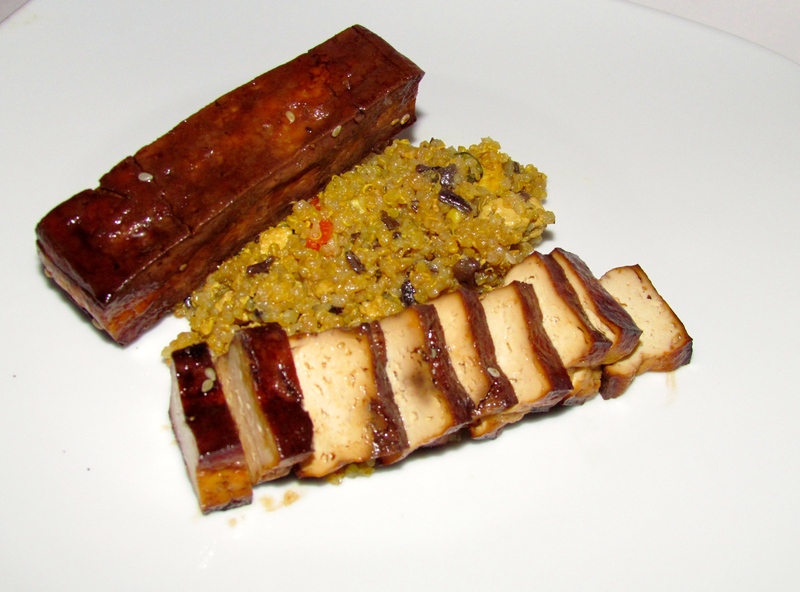 Then I made some Quinoa with mushrooms, onions and carrots and served the tofu with it. Next Bang Bang Shrimp vs Calories…….